Fig. 3.27. T1-weighted sagittal MRI scans without (a) and with contrast (b), of a 35-year-old patient with an inflammatory lesion at C2 and fluctuating paresthesias in his arms and legs. There is no contrast enhancement at all on T1, but a discrete enlargement of the cord is seen at this level. 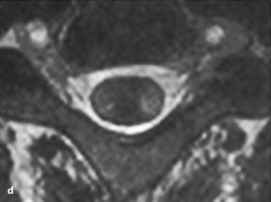 The sag ittal (c) and axial (d) T2-weighted images demonstrate an ill-defined, hyperdense, and centrally located lesion. On follow up after 6 months (e) and 1 year (f), the lesion gradually regressed inflammatory diseases. If in doubt, the safest way to arrive at the most likely diagnosis is to repeat the MRI after a couple of weeks. Inflammatory and demyelin-ating reactions vary in intensity with time, leading to different radiological appearances within a few weeks or months (Figs. 3.26 and 3.27). Tumors never change their MRI appearance in such a short time. Contrast enhancement, on the other hand, does not prove that the lesion is a tumor (Figs. 3.25, 3.26, and 3.28) [302, 332]. Furthermore, in most demyelinating diseases such as multiple sclerosis, additional areas of pathology will often be detected in other parts of the central nervous system so that additional MRI scans of the brain can be helpful in such cases (Fig. 3.25) . 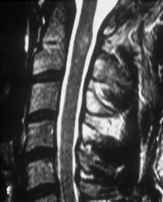 However, multiple sclerosis can present with an isolated spinal lesion. 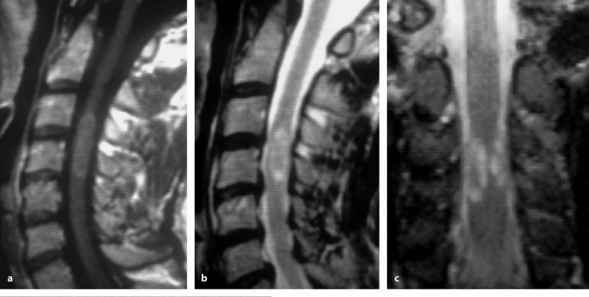 Another pathology to be considered is subacute necrotizing myelopathy with spinal cord edema and rim-like contrast enhancement (Fig. 3.29). 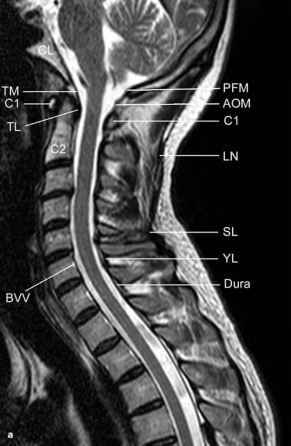 With time, spinal cord atrophy develops . Lee et al. presented a series of nine patients with nonneoplastic histologies who had been operated for suspected intramedullary tumors. Four patients had demyelinating lesions, two had sarcoidosis, two had amyloid angiopathy, and one patient an inflammatory pseudotumor. The only feature common to all of these lesions was a lack of spinal cord expansion. 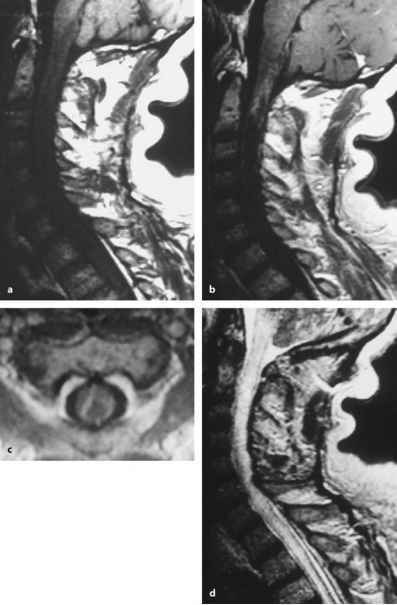 In some instances after postoperative radiotherapy, it may be very difficult to differentiate postradiation myelopathy from a recurrent tumor on MRI [261, 302, 351]. Again, the presence of a space-occupying lesion and repeated scans maysolve the diagnostic dilemma. Fig. 3.28. Sagittal, contrast-enhanced T1-weighted image (a) and T2-weighted image (b) of a lesion at C3-C4. These images could easilybe misinterpreted as a contrast-enhancing intramedullary tumor. However, a space-occupying effect is again missing. Coronal (c) and axial d) T2 images demonstrate bilateral lesions. The patient was diagnosed with non-Hodgkin's lymphoma in the operative theater. The surgeon should begin with the intention to remove the tumor completely  rather than expecting that not much can be done anyway because the tumor looks like an infiltrating glioma on MRI, for instance. Similarly, radical tumor removal should not be forced without a clear-cut demarcation just because the MRI suggests a clearly demarcated and, thus, resectable tumor. 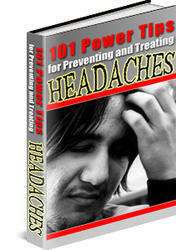 torysuggest the possibility ofhydrocephalus, a CT or MRI of the head should be performed. In patients with malignant astrocytomas, the presence ofhydrocephalus is an ominous sign as it indicates a fast progressing and possibly disseminating tumor disease . We observed hydrocephalus in one patient at the time ofrecurrent growth ofhis thoracic anaplastic astrocytoma.